Category: Acoustic Absorption, Audio Hi-Fi, Audio Hi-Fi, Automotive, Aviation, Electronics & Packaging, Electronics & Packaging, Heating & Ventilation, Medical, Noise Reduction, Polyether Polyurethane Foams, Rail, Thermal Insulation. Nominal tensile strength 70 kPa min. Nominal elongation at break 120% min. Furnishings (Fire) (Safety) Amended Regulations 1989. Standard colour is dark grey. 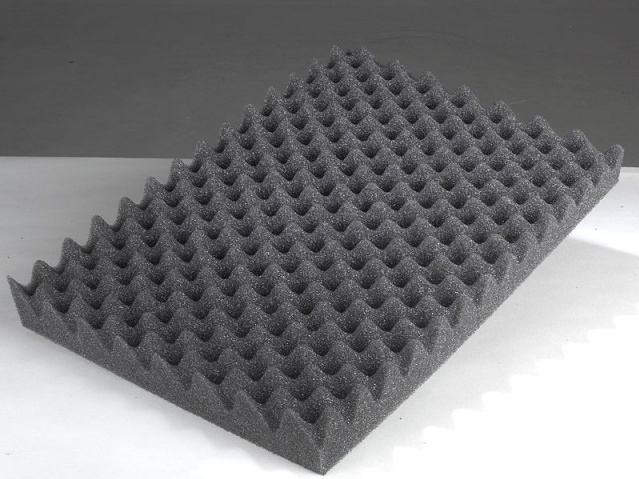 Custom Foams has worked with many acoustic companies over the years, helping to build their anechoic chambers. An anechoic chamber is a room which acoustically, is like being above the high ground in the open air. This is due to the fact that there are no reflections from walls, ceilings or floors. This makes the room ideal for testing the response of loudspeakers or microphones because the room does not affect the measurements. 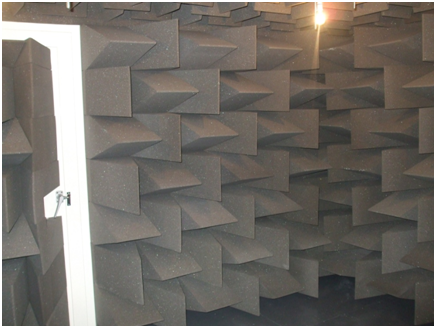 Once Custom Foams has designed, produced and supplied the foam that goes inside the anechoic chamber and it is installed, the room is immensely quiet, making it ideal for testing very quiet products or for people to hear very quiet sounds. 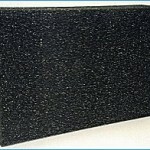 Custom Foams produce foam wedges to be fitted into a chamber. These wedges have one purpose, to prevent sound getting into the room. Sound can pass through walls, or even the foundations of the building. A chamber needs to prevent any sound from entering that room. The background noise level in the chamber is immensely low; this is probably the quietest place you’ll ever experience. 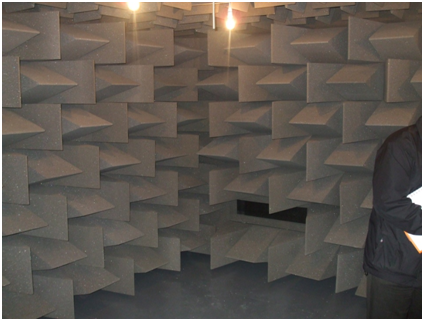 e anechoic chamber is actually a room, within a room, within the Newton building. The walls, floor and ceiling of the inner chamber are made of heavy Accrington brick and concrete to prevent sound getting into the room. Two heavy acoustic doors with rubber seals are used to minimise airborne sound. Careful design is needed to deal with structure-borne sound, for example, vibrations through the foundations. The whole inner chamber is mounted on a set of springs - neoprene rubber mounts - to reduce vibration, as is done for major concert halls, but this chamber is very much quieter than even the grandest auditorium. The design is very exacting, for instance the bridge leading into the chamber is attached to the outer but not to the inner wall, to prevent the vibration isolation being bypassed. To remove reflections from the walls of the chamber, every surface is covered in absorbing materials. The inside of the chamber is lined with foam wedges to absorb sound; this includes the floor. The floor you walk on is a wire trampoline stretched between the walls with an acoustically transparent catch net below. The wire floor is safe, but you shouldn’t enter if you are wearing high heels! We have recently finished a project with Solent University, in which we produced foam wedges to be installed into their chamber. We have spent a long time with the University listening to their requirements, visiting the rooms of where the chamber will be and ensuring that we work closely with their team to ensure that their requirements are met to perfection. The result? Perfection! We are pleased with the outcome and once it was installed, we went to visit the chamber. The results are below, and look great. The foam used in the chamber shown above is KCME25 Grey (VE25-130). 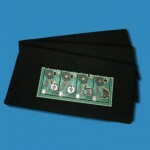 It is a good acoustic foam and works very well for this application. We also have other foams that will be suitable, such as VE24-85 Grey. 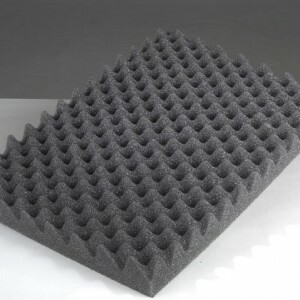 If you are looking for a supplier of foam for an anechoic chamber that you are looking to build, or even some advice on what foam will work best, we are the knowledge and skills that you are looking for. Our team has years of experience in this field and would enjoy working with you on a project for this requirement. Call us today on 01908 312331 to discuss what you need.